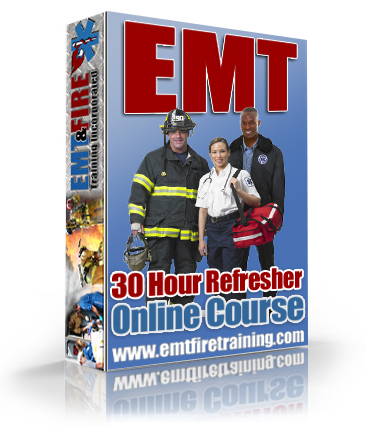 Florida EMT Refresher Course Online - 30 Hour : EMT & Fire Training Inc. This Florida State Approved and NREMT accepted EMT Recertification Refresher Course can be completed entirely online and includes all the hours of instructor led lectures required by the NREMT and Florida for an EMT recertification refresher. Upon successful completion of the Florida EMT Refresher (attend all online lectures and complete the additional online activities including passing assessment exams with 80%+) you will be issued a certificate of completion with the appropriate credentials. This EMT Refresher is worth 30 continuing education hours and can also count as a NREMT EMT Refresher. Included are 14 hours of online Virtual Instructor Led Training (VILT) lectures held in our virtual classroom, as well as 16 hours of self-paced Distributive Learning (DL) lectures available online in our learning management system. Students may complete the lectures in any order. Check the VILT CALENDER for dates of VILT lectures. Refund Policy: Refunds must be requested before completing 4 lectures and within 30 days of purchase. Do you need test prep with this refresher? Get 10% off the price of this refresher and the test prep by purchasing both products together now. Just add them to your cart to see the discount automatically applied! Copyright 2009-2019 EMT & Fire Training Inc. All rights reserved.